recently moved from just outside of Washington DC back home to Texas. No... I'm not a kid. I may act like one because to me you only get old when you decide to be "old". I've been in another business, successfully, I might add, for the last 42 years. I'm good at solving problems, adapting to new and ever changing situations, I'm organized and I like to do things right... the first time... every time. That's not easy and I know it, but I try, and that along with a never quit work ethic has taken me around the country and the world many times over. So why do I want to be here? Frankly to see if this is what is right for me at this stage in my life! I've spent about as much time traveling this country as any OTR driver; been to every major city and most smaller ones too... Been to all 50 states many times over and I have never grown tired of it. I love the experience of seeing things, meeting people and I love driving. I have considered trucking as a career switch for quite a long time and never got my CDL; I regret that but I'm studying now. ( Took an online practice test and passed with flying colors... even without studying ) From what I have been told by some, there is actually some really good money to be made, if you own your own rig that is, from some of the better small to medium size companies. NO, I'm not talking 40 to 50 grand but almost double that! Something in the order of $2.50 plus per mile! Maybe that's pie in the sky but I'm here to find out if it's true and if it's possible for a 60something to transition to a trucking career successfully. Anyway, this is a start about who I am and why I'm here. I have enjoyed and appreciated what I've read here and look forward to reading and participating in the future. Thanks All for the kind words. Yes it has been fun...and scary, challenging, exhilarating and a lot of other adjectives. The thought of pulling a load 3 times longer than a 53 foot trailer can be intimidating to say the least. Strangely though you learn to take it in stride. You slow down, use your brain and think through each move way before you do something. I've got great teachers and mentors around and the team I'm working with has made the transition as painless as possible. We usually work either in pairs or as a group of about 4 to 5 trucks so we try to quite literally keep each other out of the ditch or off telephone poles and signs and other things. As you can imagine turning is ALWAYS interesting! We use steerable trailers, controlled by the driver so the driver behind helps keep you out of trouble. The last truck however in the "convoy" usually has a lot more experience since his extra eyes are the pilot car at the rear and communicating with them is key. I've been at the back a few times now, usually with loads under 140 feet and I can tell you, one feels the pressure of that position big time! The term "city driving" takes on a whole new meaning when you're menuevering 140 to 200 feet through traffic, trying to stay together, and you have cars, motorcycles and other trucks literally zipping around you. It seems your mirrors aren't big enough and your head is moving so fast from mirror to mirror that you feel like a bobble head. We have all joked that we look out to the mirrors as much or more than we look out the front! My first long load; a beam of 140 feet; was into Houston just after the curfew lifted for oversize loads...about 9:30 if I recall. The traffic was insane and I'm sure I must have looked freaked out by the time we got to out job site. Needles to say I survived but the "pucker factor" was way up there. Our lead driver laughed that it took about 5 minutes to get me peeled off the seat when we finally got to our job site. And getting in and out of job sites is often a slow and careful process. One misstep and everything comes to a grinding halt. Ok... enough for now... You all take care and I'll stay in touch. I have been a little busy and haven't taken the time to give you an update on my driving career in many months. So here goes. I took your advice and stayed with my first driving job over a year. Glad I did because it was a huge learning experience from the get go. Hauled dry van and then reefers all over the place in every weather and situation one can imagine. Including a couple of hurricanes and a blizzard or two. 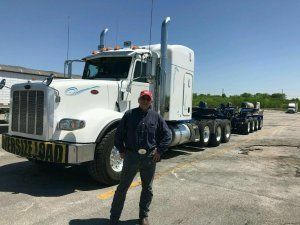 The last 10 months I hauled reefers and found it to be challenging and frustrating all at the same time. It's the nature of reefers to sit at docks and wait sometimes for hours and for me that was a frustration but one learns to adjust and get over it so it all worked out. I spent a lot of off hours reading and following this web site so it wasn't a loss as far as I saw it...I was learning the whole time. I left that company with a great reputation and have been asked to come back several times so I must have done something right. In fact my fleet manager and I have spoken regularly since my departure and if I wanted I could go back there any time. Starting this January I made a move I have been very happy with. I have wanted to get into flat bed for a long time with the end goal doing heavy haul. In fact I was recruited by a major flat bed company and went to orientation for them. In the end though that didn't work for reasons I am to this day not sure of. Turned out to be a blessing however as I immediately landed a heavy haul job making lots more than I thought was possible. I get the physical work that I love and need; I have to think about my load in ways I never did before; it's an intense challenge...which I love...and best of all...I get to see my family more! After 3 months doing this I'm in better physical shape, better mental shape, a better driver and I get to do something seriously outrageous! Drive a big rig weighing just about 200,000 pounds and total bumper to bumper lengths of almost 200 feet. In some ways I can't believe I'm doing this and in other ways I feel this is what I was meant to do. Haul insane weight and lengths and do it well. I'm not an expert; not yet anyway, so don't take my statement of "doing well" as bragging. But I'm doing well and learning all the time and having fun at the same time. My boss/dispatcher loves what I'm doing and how I do it so things are working out well. I was given a Peterbilt they were saving for the "right" driver this month so frankly I'm a happy camper! I would like to add a thank you to Brett and Old School. You two in particular were a great help to me. Your articles and responses to my queries have been a big help. In the end, I survived my first 18 months...and I plan on sticking with this. It isn't easy. I'm glad of that. But when the day is done and I look back on it, the sense of accomplishment I have felt and feel right now far exceeds the difficulty... and for that... I'm grateful. Be safe out there drivers and remember; you may be sitting in that cab by yourself...but you're not alone. We...all of us...have been or are, in the place you are. Hang in there, it really is worth it. What parts of the county do you prefer to run? There is a run I've done a couple of times that I love. Laredo, TX up to the North end of Utah and then to Idaho. For the first day and a half you are completely off the interstate ! From Ft. Srockton to Carlsbad NM is busy with oil field trucks but here have been times I didn't see anyone on the road between Laredo and Ft. Srockton,TX for 20 minutes in the middle of the day. There's lots of great local food along the trip too and if your through there at night you have to do a 30 minute break at one of the many picnic areas...the stars are amazing! It's funny this was asked recently because I just did a 1900 mile run and had to use recap hrs to get it done. I think I started with about 22hrs and what hurt was only getting 2.5 on the second day out. I was good after that but those short hour days are a killer on churning out miles and trip planning. It felt like I spend as much time calculating my potential stops, hours and time zones as I did driving. In the end it was pretty stressful due to the one day of only getting back a couple of hours. I pull a reefer so doing 34''s is pretty normal for me especially when you're waiting for a meat shipper to fill a trailer or get export paperwork done. It is nice as was said having a fresh 70 but I have to say when I can do a couple of long runs back to back and do it recouping hours it feels like I've really done something. Probably just a new guys perspective but it does feel kinda cool to run for 2 or 3 weeks non stop once in a while. Thanks Brett, Actually it's frustration with the way a huge company with almost 10000 drivers works...or doesn't work. You see I have done what you've suggested and yes, I would be considered one of their top tier drivers, even though I'm new. I do make those calls to get my load eother loaded on unloaded early, but...and here's the part that is out of my control; the driver doesn't dictate what he or she is dealt . You have to react to what's going on around you and work within the playing field. My frustration is from a lack of follow through by those who control your fate. Getting delivery numbers isn't something new, but if what you're given isn't correct or non existent that's what makes life difficult. It shouldn't be a surprise to them when you ask for or need the information and yet it's a rampant problem that many of the drivers I've spoken with at the company complain about. That's my frustration. This isn't brain surgery and it's not some new aspect to the business! I am new yes...but I've managed to figure out enough to keep rolling weeks at a time without doing a 34hr reset and yes...I get there on time or ahead of time whenever possible. The only thing that has ever stopped that is the occasional load that has to be reworked because it couldn't be legally pulled. Once again, a curve ball you have to deal with and keep moving. I've owned a high value business before and made it work in a similar cut throat world...television production... where my investment was nearly 350 grand in gear alone. Fixing an 85grand camera and keeping your production on budget and on time all over the world wasn't a piece of cake or cheap eirher. But you do what is needed and keep moving. Top that off with being your own booking agent. Yes... I get what you're saying. I'm doing what I can to learn this industry and this forum helps but there are times when being good or smart or friendly or aggressive isn't the whole picture. When you work for people who's livelihoods don't directly get affected by yours, their motivation is different. An hourly paid employee is not motivated the same as the commission employees. Yeah, the company wants to make money and should but we can't kid ourselves into forgetting that the amount of waste, miss management and general lack of motivation at many if not most established big companies is pretty real. When I spoke about the incident where I wound up sitting for hours that had nothing to do with me or my skills...that, was simply dispatch not getting their information right and I got left standing there waiting. Now it's not all been bad. I'm in the midst of back to back runs that are going to net me over 3300 miles this week! And by the time I get through I'll be close to 4000 miles in about 8 days so I can't complain. You yourself have said the first year is the most difficult and I agree. I just think that it's not always about how well we new drivers do our job, it's also about how huge companies with huge driver pools manage to take advantage of and manipulate new drivers. If the livelihood of those in the office really depended on them getting it right as much as our job as drivers does, I suspect there would be a lot less turn over at big carriers and generally happier people all around. Trucks make money when they roll. Drivers make money when they roll. Staff employees at the big companies make money regardless. Add to that the number of drivers they have to manage, which is often hundreds, and it's easy to see how someone would want to be where they are dealing with a fleet manager who only oversees 30 or 40 drivers and I seriously motivated, by a commission or percentage for instance, to keep those drivers rolling. I'm going to stick this out. I knew going in that this is a tough business and that frankly, only the strong survive. I think I've managed to do pretty well so far and I have hopes that my success will turn into a viable, workable and decent living for me and my family. I guess having been a freelancer for 25 plus years out of 42 in the same industry gives me a perspective that's a little out of the normal company/owner operator debate. Sometimes it's not how good you are, it's who you know, who you smooze, or even how lucky you are... or seeing the break and going for it...being adaptable and smart enough to think on your feet and adjust in the right direction. In the end though, it's also about simply being tenacious. Having the strength of will to get up when you're knocked down, whether by traffic that's holding you up, or information not relayed correctly or frustrations. Being able to keep going and keep learning is key for me. Trying to not repeat mistakes, learning from each day and forging ahead. I will be here tomorrow, and the day after that and the one after that too. I hope to be smarter and I will always keep my options open...whether as a company driver or as an owner operator. Either way, I'm not going to make that decision lightly...or quickly. I know there are good companies out there that would want me. I just have to pay my dues, learn everything I can, do the time and be safe and smart. No big deal right? When I said my best friend is making more in 6 months...I meant he is taking home....profit...after taxes...more than I'm making in a year...actually it's probably more than I can make here in a year and a half. Maybe he's unique and blessed but whatever the case may be, it's real. That's why going the o/o route is aluring and it's hard to not consider it as an option at least. Old School and Brett I know that this is "old hat" for you; standing in the truck stop getting beer cans tossed your way...as you said...but the problem many of us face out here is in fact company based. I'll try to explain. I did the company route and have stuck out almost a year or frankly near starvation. The only place most of us could start with is the big companies and if anyone has the system rigged in their favor it's the big companies. The promise of making 40 to 50 grand a year...even 35 to 40 is common and yet, it's really tough. How many jobs pay little to nothing when you're stuck waiting to get a load for 34 to 50 hrs? Oh... and why were you stuck sitting there you ask? Because your dispatcher/fleet manager didn't tell you that the load your qualcomm said was going to be ready on say Friday morning between 6am and that afternoon at 6pm, actually wasn't going to happen for another day. The shipper never intended the load to be ready Friday! They intended for the load to be ready Saturday. So there you sit, waiting, eating...or not...but the wheels aren't rolling and so you make no money! This happens all the time. Or get to a receiver and have to spend 3 hours getting the correct load receiving number from your dispatch/fm and you wind up at the back of a first come first serve line until 6pm again...having started your day at 4am there isn't any time left to do anything. Once again, another wasted day. As a new driver I knew there were going to be lots of things to learn and I also wasn't kidding myself that big companies didn't get big by giving money away. But what became all too obvious was that they don't care if you sit for hours or days...you aren't costing them enough to be a concern. I have often wondered how they became so successful with the level of incompetence that would have gotten me fired! What does all this have to do with owner operator discussions you ask? A couple of things. I do work for one of the major carriers and I barely make enough to feed my family. I have insurance I can't afford to use...the deductible I can't cover. I have vacation I can't afford to take. And I have bills I can barely afford to pay. All while I try to scrape through the first year or two of driving. Company driver is not a dirty word it just depends on which company. The majors will sell you a great story, show their new trucks and make promises they have no intention of keeping so I can understand why being and o/o is enticing. I have o/o friends who make more in a day than I make in 2 weeks sometimes. And no...that's not a line of bull either. I know how they live and have seen their expenses...and their real bottom line. I too have owned my own business and was very successful at it. When the business changed I went the company route. There are o/o's who make good money, I know some. And there are others that have failed. I know them too. I suspect the trick is to either find the right company, willing to pay a decent living wage or the right company to lease on to as an o/o. There seems to be a huge amount of emotion wrapped up in this discussion so far and a lot of challenges and counter challenges. It's certainly been an interesting read. But what I've seen here is the same as everywhere lately...people have dug into their positions and are right no matter what...end of conversation. I suspect there is money to be made in this business, otherwise it wouldn't be as big as it is. The trick like life, is to find the right niche, learn it and go for it, whether as an o/o or company driver. Me...I would like to find the right company someday soon. My guess is it will be smaller than the big guns who's goal is to extract every drop of energy you have and pay as little as they can get away with...because I have looked at being an owner operator too...and as scary as it may be it still looks better than what I have now. Which is probably why so many drivers think about it in the first place. Making less than 40 cents a mile for a couple of years is tough because there is no guarantee to get 3000 miles a week. No matter how good you are, someone else's incompetence dictates your paycheck or lack thereof. When you consider what a brokers or leasing dispatcher's motivation is; to keep you moving because that's how they get paid, as opposed to a company dispatcher or fm who's getting a salary whether you move or not, it's not difficult to connect the dots and want to go where the dollars are. And yes...I do understand all that's been said about risks here. Just saying that when the word company gets used perhaps a distinction should be made so that those on the fence can get a better understanding of where you're coming from. As I said, my best friend is making in 6 months...take home after taxes...than I am making at a major carrier. For me, that's hard to turn my back on.